The Minneapolis-based company created four organic master sauces that can be used as a base for recipes or on its own. A Minneapolis-based company is hoping to inspire people to get creative in the kitchen. Freak Flag Foods created four organic master sauces that can be used as a base for recipes or on its own. "This idea really came about, about three years ago. We really wanted to create a self-expression brand... a sauce company where you could be yourself in the world and in the kitchen," said Fred Haberman, co-founder of Freak Flag Foods. The company officially launched this past fall. They have four organic master sauces: Zesty Green Herb, Kick'n Curry Mole, Super Kale Pesto and Smoky Red Mustard. "We think of them as master sauces which means that they are something you can add to something simple, plain... a grilled chicken breast, a plain bowl of pasta, and really elevate it into something that tastes like you've been working in the kitchen all afternoon," said Mary Jane Miller, corporate chef for Freak Flag Foods. 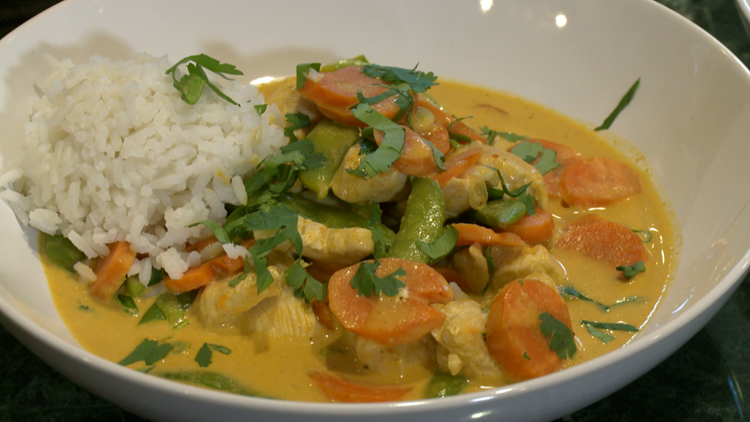 Mary Jane Miller's Chicken Coconut Curry Stew with Freak Flag Foods Kick'n Curry Mole. Miller creates not only the recipes for the sauces themselves, but also consumer recipes to give people ideas on how to use them. However, she hopes it inspires people to experiment with new dishes. "I like to give people permission to get freaky in the kitchen," she said. Haberman said the master sauces are inspired from around the globe. "I've always been enamored with sauces from around the world. My wife and i lived in Kazakhstan many years ago in 1993... that was the inspiration for the Zesty Green Herb," Haberman said. Haberman said a big part of his life is following his passions. "I run a marketing agency in town. I've also been involved in the Good Food Movement for a long time working with helping co-found Urban Organics. I also started the U.S. Pond Hockey Championships," he said. Mary Jane Miller's White Bean and Veggie Penne with Freak Flag Foods Super Kale Pesto. Haberman went on to say, "For me, this brand is really at the end of the day about celebrating individuality. How do you continue to explore? How do you continue to lean into what you're passionate about? And for me, you have this incredible opportunity to create something unique every day in the kitchen." You can find Freak Flag Foods at Lunds & Byerlys, Coborn's, Twin Cities co-ops and online. One sauce retails for $7.99. Freak Flag Foods has five more sauces coming out in the spring. 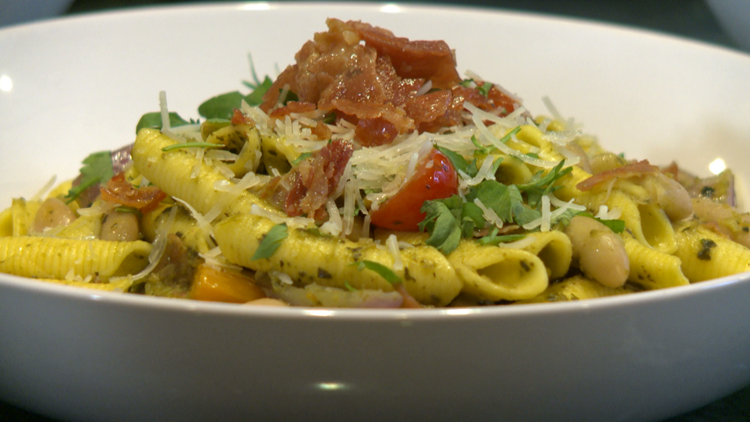 There are many recipes on their website, but the ones Miller created for this segment include: Chicken Coconut Curry Stew, White Bean and Veggie Penne, and Smoky Cheddar Bacon Pub Cheese.